The 2016 Chihuly Workshop Studio Edition Jade Green Seaform harkens back to 1980 when Chihuly first began developing this organic series, in which he originally chose a softer color palette. 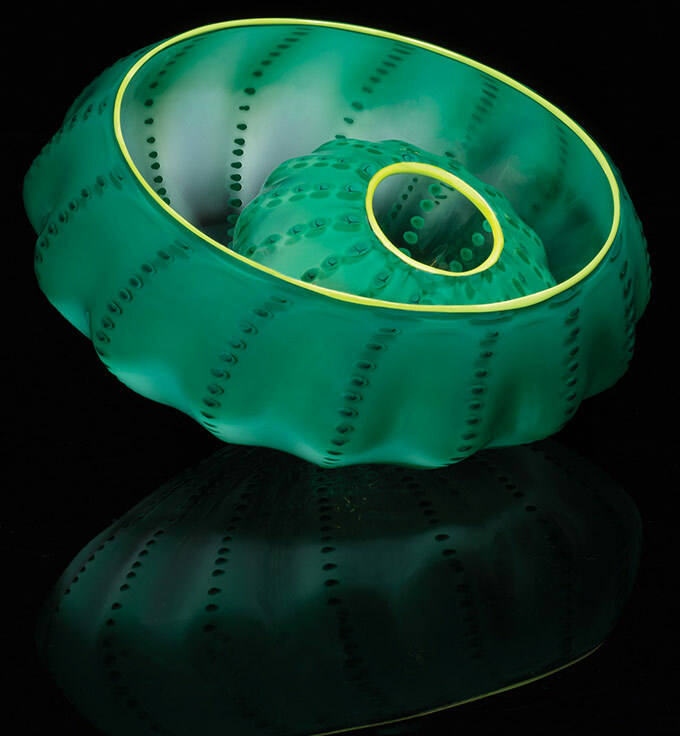 In this two-piece composition, both the transition from rich saturated green to a transparent base and the darker green "beads" striated in the folds of the form are echoes of earlier iterations of this beloved series. 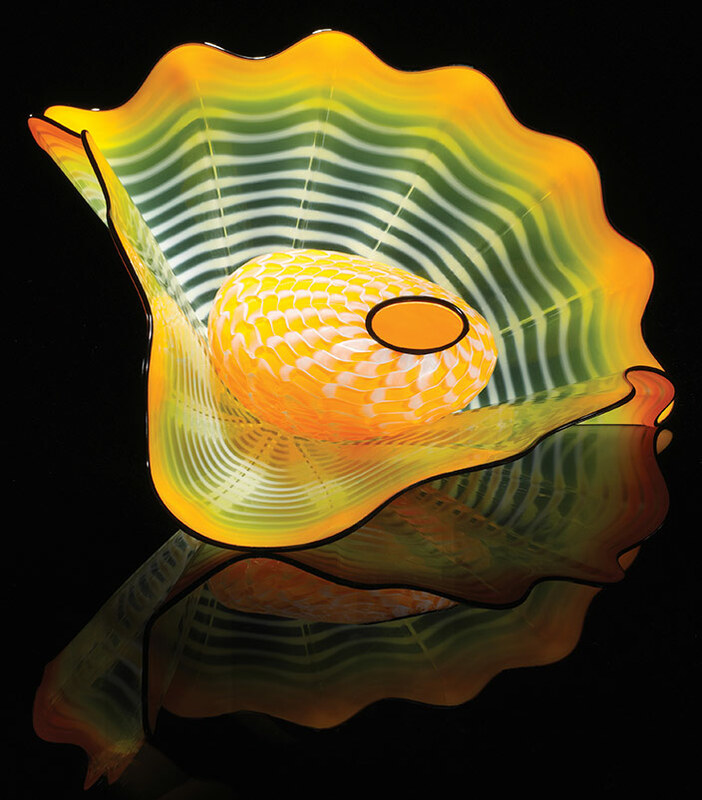 This year’s Star Fire Seaform is another great example of this Chihuly series. 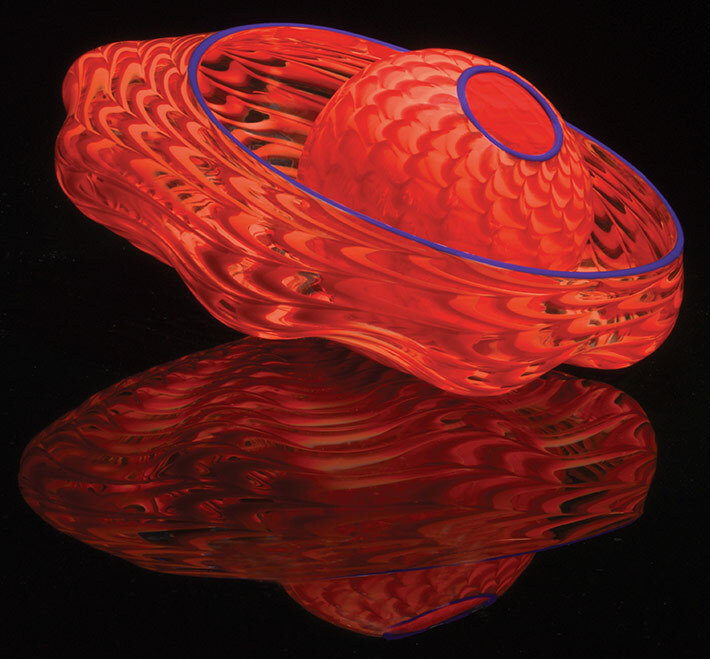 The larger element, which is asymmetrical as if shaped by tidal motions, is encircled by a brilliant twisted orange and red body wrap that accentuates its rhythmic swells. The smaller and slightly more opaque interior element anchors the focal point of the sculpture. The intensity of the fiery red and orange twisted body wrap is tempered by the clear base upon which it is applied. With its free-spirited essence and asymmetry, the Persian series is a visual presentation of the glassblowing process, an intuitive yet technical execution, like a frozen fluid thought. An outer band of golden yellow rims the larger element, fading to an incandescent transparency as the dynamic white body wrap emphasizes the sweeping motion of the sculpture’s ribbing and scallops. 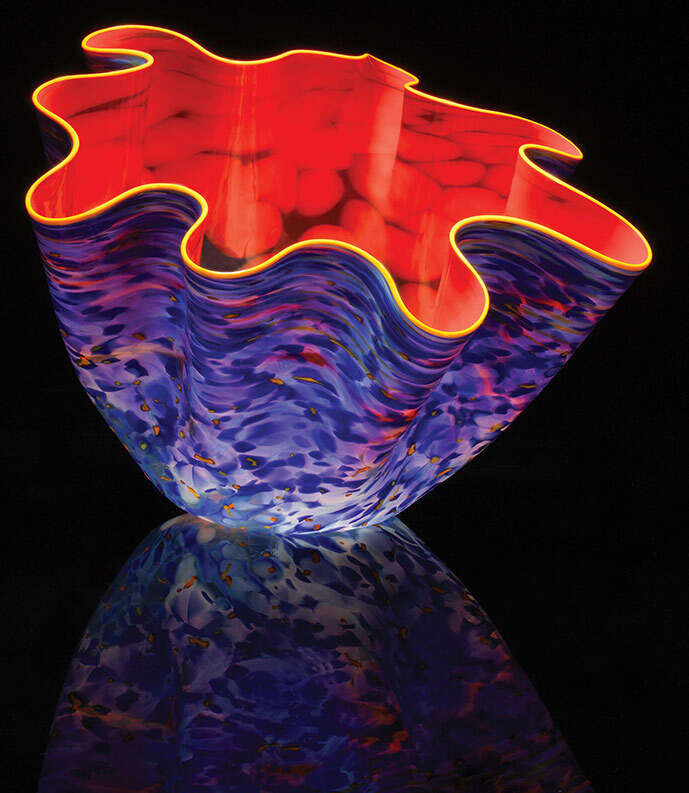 A stained-glass window and a foggy day inspired Dale Chihuly’s vibrantly bold Macchia series. Layer upon layer of glass compose Nordic Blue Macchia, the fourth and final 2016 Chihuly Workshop Studio Edition. Clouds of variegated blues eclipse the exterior while a secondary layer of orange and chartreuse flecks, called "jimmies," dances across the surface. The vivid red-orange interior provides a luminous inner glow. I hope you have enjoyed seeing Chihuly’s 2016 Studio Editions and I look forward to hearing from you with any comments or questions you might have!